Now that you have a better understanding of what the Thirteen Intentions are, let us see some evidence of how reality is implemented through them. Be advised that I won't go into too much detail here. There is really no end to the amount of knowledge that we can obtain from the Thirteen Intentions and their relationship to various aspects of reality. The chromatic scale is a 12-note musical scale. 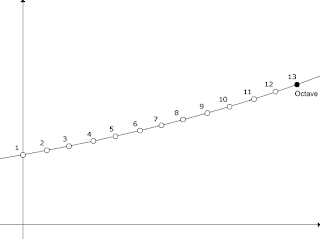 For those of you not acquainted with music theory, know that this scale repeats at the interval of an octave. Two notes of the same letter, an octave apart, are directly related by a scale change in frequency. But let us remember that we are working with thirteen Intentions of Creation. There is a 13th note that is not part of the chromatic scale's context, but that logically follows in progression after the 12 notes. This note is the true last note in the octave because it is the "return" to the next higher octave. It introduces the base / root frequency of the next octave, and so in a sense it is the octave. Without the 13th note you cannot compute the frequencies of the other notes in the octave. NOTE (11/05/2009): Someone called attention to the fact that an octave is strictly eight notes. Fair enough, but the idea here is that there is an equivalence between the 7+1 system and the 12+1 system to the extent that the 8th note is also the 13th note and vice-versa. The next paragraphs should make this clear enough. The piano keyboard has eight white keys and five black keys. In total we have 13 notes with the 13th also being the first note in the next octave. The 8th white key becomes the 13th key if we count both white and black keys in order. The word octave comes from octavus meaning "eighth"; therefore, notice how there is an intrinsic significance about number 8. Even more interesting, the 8th note of all 13 notes that comprise the octave is the dominant one, and this works the same for Intention #13, which is the "leader" of all the others. Anyway, you can see that there is a direct correspondence between numbers 8 and 13 when it comes to music (i.e., sound and frequency). This is because an interpretation for Intention #13 is that of an infinite vibration, also known as Love, and the concept of infinity corresponds to Intention #8. The traditional scale in Western music is the diatonic (seven notes) scale. In this scale's context, after seven notes (white keys) the eighth note begins a new octave as it completes the last octave. Also notice that there are 7 intervals in 8 notes and 12 intervals in 13 notes. The five black keys on the piano are the pentatonic (five notes) scale, which is the complement to the diatonic scale. If we count 5 black keys and 8 white keys we get 12 intervals, and if we play these keys in order, without leaving any out, we get the very symmetric and uniform structure of the chromatic scale. In terms of musical harmony, the diatonic scale is more important than the chromatic. The diatonic is the musical scale. But considering our background knowledge about the Thirteen Intentions, we can assume that the chromatic is the standard universal scale, and thus not necessarily the standard musical scale. All musical scales are derived from the chromatic; they are either subsets of the twelve notes or they are modulations of these notes to produce extra notes. More than 12 notes in music is valid, otherwise we would have a limit for musical creativity, but still no musical composition can escape from being based on a 12-note symmetry and a 7-note harmony. There is more than one possible interpretation for what a dimension is. In the strict geometric sense, a dimension is one of the three spatial dimensions: width, height and depth. A spatial dimension is a mathematical construct, yet time, for example, is considered a temporal dimension. Dimensions can also be associated to parallel / alternative universes, planes of existence, and even levels of consciousness. There is also a fundamental connection between dimension and frequency range. Sound as frequency plays a key role in matters of the universe. In this context, the term dimension may be replaced by density. Each density is a level of how much sound is "compressed," and the greater the compression, the faster the vibration. You may already have heard about the theory that consciousness exists in all dimensions at once. It is only human perception (five senses) that is restricted to a tiny frequency range interpreted as a three-dimensional world. But the universe is multi-dimensional; there are many other worlds, many other dimensions. These worlds can share the same "space" because they are resonating at different frequencies. It also makes sense that a dimension exists only because it receives support from a higher one: an example being that in the physical world every object receives support from the gravitational pull of another. Therefore, bear in mind that there is always a higher dimension offering support and serving as the basis for our current dimensional perspective. The geometry of the universe is bounded by a dodecahedral field -- let us call it the universal dodecahedron. Each one of the 12 faces of the universal dodecahedron is a pentagon, and each pentagon is an universe in itself. The 12 universes are all "flat" and connected to each other. 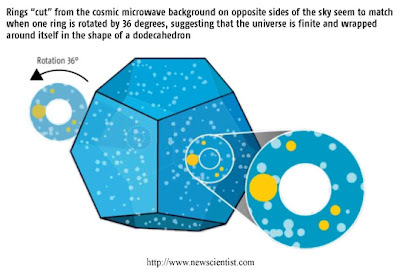 Parallel universes are those pentagons on opposite positions of the dodecahedron. Also, since we are dealing with 12 universes instead of 1, it is better to consider the universal dodecahedron as a multiverse. Of course, as the very word universe implies, in the end there can be only one universe: the Universe with capital U. Thus we can say that there are 12 universes and 1 multiverse (the Universe) giving a total of 13. All things considered, the number of dimensions in the universe is 12. Of course, the number of fractal dimensions is potentially infinite, but this fact does not conflict with the existence of 12 non-fractal (integer) dimensions. See the image below. NOTE: In José Argüelles' work, aspects become "Sun Seals" and intentions become "Galactic Tones," though I have seen a reference to "tones of Creation" at http://www.13moon.com, one of at least four sites dealing with Arguelles' calendrical and metaphysical system. Please go to the External Links section to learn about the fundamental differences between Argüelles' 13-Moon Dreamspell Calendar and the traditional Mayan calendar. It is important that we understand that the cycles described by the Tzolkin are fundamentally of a spiritual, non-astronomical nature. The Tzolkin was used both as a personal as well as an astrological calendar. The Mayan developed calendars that would keep track of the flow / process of Creation. They would also keep track of linear time, but they would not let it take over their minds and overshadow the multidimensional aspect (cycles within cycles) of Creation. More importantly, the Maya knew how consciousness relates to their traditional calendar. Consciousness is at the very center of the cosmic process of Creation described by the Tzolkin. One is not controlled by and does need to blindly follow the Tzolkin; instead, one can learn through this calendar about a divine plan for the evolution of consciousness. As Ian Xel Lungold puts it, "The Mayan calendar is not now, nor was it ever used to tell time. It has always been a tuning device for consciousness." A Creation cycle is the same as a Consciousness cycle. Each Creation cycle has 7 "days" and 6 "nights" forming 13 main events intended for consciousness to go through. The 7th day corresponds to Intention #13; it is a process outside of time in which a transition between one cycle to another of a higher order takes place. But the energy and meaning of this transitional process also has a reflection in linear time, and so it actually happens inside the 7th day of the Creation cycle, although the concept of time will be meaningless for those experiencing the associated shift in consciousness. Is it time that operates according to the cycles of Creation, not the other way around. The Maya divided each day into 13 hours, not 24 hours. 13 hours. And then they divided those 13 hours, notice 13 intentions, into what we would call minutes, and then they divided those 13 minutes into what we would call seconds, and then they divided those 13 seconds by 13 and 13 to where every single moment was individually divided by 13 infinitely. That was their understanding. This was very central to the Mayan's understanding. We have the 12 Zodiac signs / archetypes plus the archetype of the Sun, which is the 13th element. Ophiuchus, the "lost" 13th sign, could very well represent the Sun because its constellation occupies the area in the sky that points to the center of the galaxy where a "Great Central Sun" is supposed to exist. There is a relationship between color and sound to the extent that a number of basic colors in Nature are directly related to the musical scale. Mythologies: 12 Greek gods, 12 disciples of Jesus, etc. Star systems also seem to play by the rules of the Thirteen Intentions. There is speculation that the solar system has in fact 12 planets, or 12 main astronomical objects not counting the Sun. Some planets could have been destroyed and/or they exist in higher dimensions. Exotic orbits can also be the reason why some planets remain unknown and/or undiscovered. Chakras: there is a 7-chakra system as well as a 12-chakra system, because the latter also takes into accout five "virtual" chakras. Finally, here is something that I came upon recently: In the movie The Matrix (1999), the character Neo ("the One") sought Trinity, whose name represents number 3. As you can see, Neo and Trinity together form the number 13. NEXT: Part 3: the Cycle of Life. Lungold, Ian Xel. "Welcome to the Evolution: Mayan Calendar Comes North (The Condor Flies to the Eagle)." Whitehorse, Yukon Canada. 22 June 2004. Lecture. Muir, Hazel. "Tantalising evidence hints Universe is finite." New Scientist. Reed Business Information, 8 Oct. 2003. Web. 25 Oct 2009. Stanford, Amitakh. "The Twelve Universes Are Pentagons." Xee-A Twelve. 25 Oct. 2009. Valerian, Valdamar. Matrix IV: The Equivideum. Yelm, Washington: Leading Edge Research Group, 1994. White, Daniel. "Why are there 12 notes in equal temperament?" Skytopia. Daniel White, 2002 onwards. Web. 25 Oct. 2009.